Built in 1948 and known as Bears Stadium for the first twenty years of its existence, Denver's Mile High Stadium was originally built by Bob Howsam with minor league baseball in mind. Denver's Bears (1948-84) and Zephyrs (1985-92) brought AAA baseball to town, but by the late 1950's Howsam wanted more. In an effort to gain a franchise in Branch Rickey's aborted Continental League, the stadium underwent its first expansion. When the CL didn't materialize, Howsam suddenly found himself with a major league level stadium - but not a major league level team to fill it. Fortunately his timing couldn't have been better. The American Football League was forming, and Howsam and his family were awarded the Denver franchise, which became the Broncos. While Howsam would divest himself of his sports-related properties the following year, he had lit Denver's major league fuse. 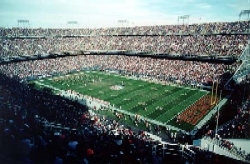 By the 1970's Mile High Stadium was owned by the City of Denver and had a capacity of nearly 80,000 - and had been converted into a unique multi-purpose stadium capable of hosting both baseball and football without significantly compromising seating for either sport. In 1980's the Denver Gold were among the USFL's early attendance success stories, while in the 1990's Howsam's Major League Baseball dream came true as the Colorado Rockies expansion team began its history with two years at Mile High before moving into its own facility. By 1999 however Mile High was beginning to show signs of age, and a new, replacement facility was built next door. In January 2002, Mile High was demolished to accommodate parking for the new stadium.